End the year with a bang & a touch of shimmer. 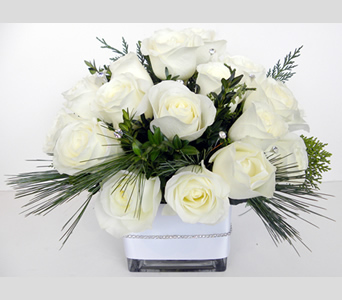 This elegant arrangement includes a clear glass vase, embellished with white satin ribbon & a strand of Czech crystals, filled with 1 dozen white long stem roses illuminated by scattered crystals throughout. A beautiful addition to your party or a wonderful gift for someone special. Order now for pickup or local delivery. View all of our seasonal arrangements. Throwing a New Year's Eve bash everyone is sure to remember? 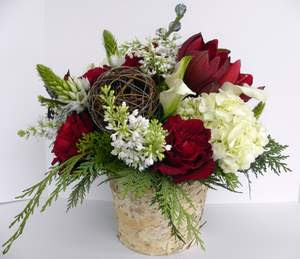 Well we have some dazzling custom designed arrangements to wow all of your party guests! These white & silver themed centerpieces add a touch of class along with some sparkle to your party decor. So go out with a bang this year & get your order in now before it's too late. View all of our arrangements. A stunning option for whatever holiday you are celebrating this season. 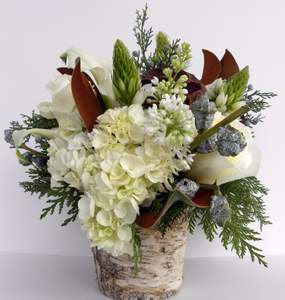 This arrangement features hydrangea, lilacs, star of Bethlehem, calla lilies & roses accented with eucolyptus pods, magnolia leaves & seasonal greenery in a unique white birch vase. You still have time! Stop by one of our Boston shops, order online or have one delivered locally. View all of our holiday arrangements. Have you seen our holiday arrangements? 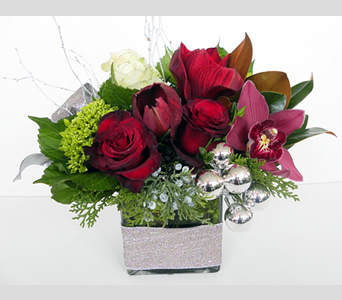 Beautiful arrangements that are perfect as gifts during the holidays! All are designed by our talented team at one of our Boston shops. Custom designed arrangement filled with red amaryllis, roses, cymbidium, orchid blossoms, hydrangea, magnolia leaves, white birch branches, juniper berries, & silver ornaments that fill a clear glass vase bound with glittery ribbon encompassed with silver wire. A beautiful centerpiece for any holiday party! Click here for more information or to order online. To see more of our designs, click here. Have you seen our new gourmet items? 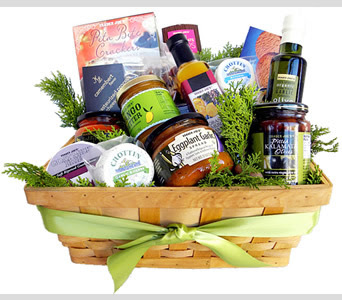 Beautiful baskets filled with gourmet items perfect as a hostess gift, thank you or thinking of you package during the holidays! All of the baskets include natural, top of the line products and are designed by our talented team at one of our Boston shops. View all of our gourmet items. 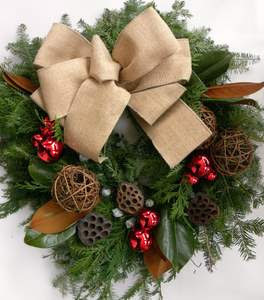 This 16" wreath is adorned with a burlap bow, lotus & eucalyptus pods, rattan spheres, magnolia leaves & clusters of red ornaments. It is sure to brighten any door for the holiday season! 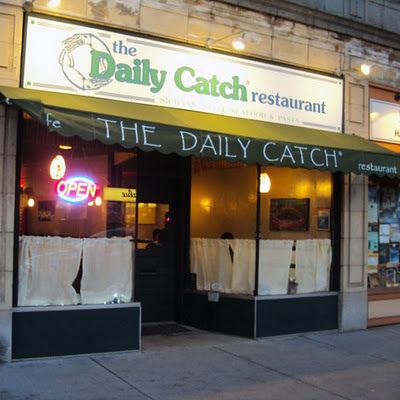 The Daily Catch, our Featured Local Business Of The Week, delivers superior seafood & ample harborside views with a location in Boston's Seaport District at the Fan Pier. We love having so many local restaurants with great food near our shop! To view this business's web site, please click here. What Style Is Right For Your Wedding? Not sure what style you want to go with for your wedding? 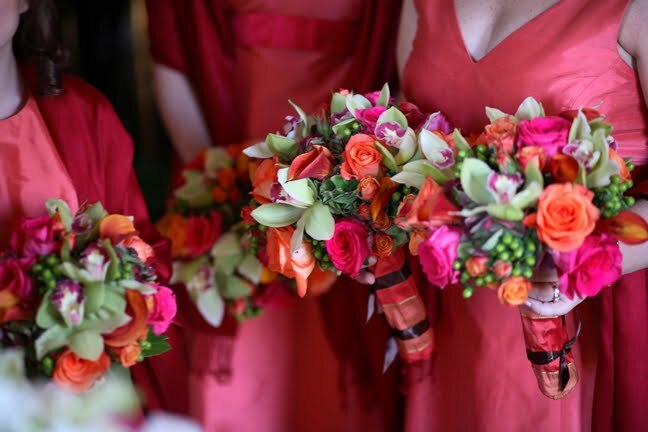 Take a look at our Featured Weddings page for some ideas that will hopefully inspire you! Contact us to make an appointment with a member of our team to go over your ideas. Come view samples of our Corporate Services! To inquire about how we can enhance the decor of your work space, please contact us. 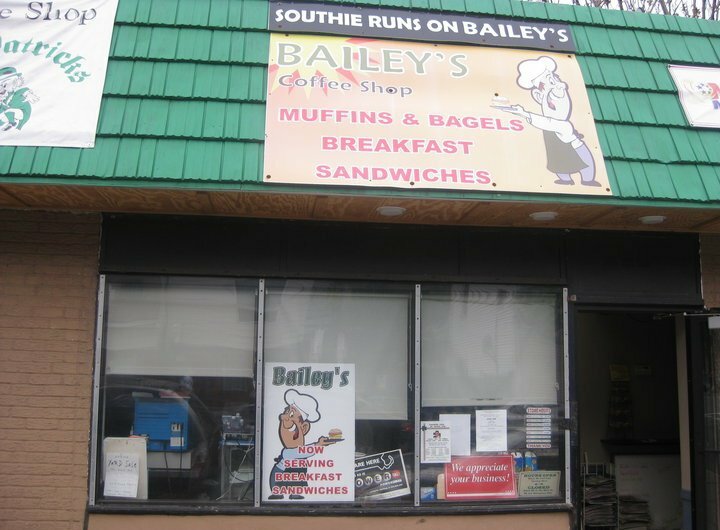 Enjoy some of Southie's best coffee at Bailey's Coffee Shop! They keep us running at our East Broadway shop :). Our custom holiday arrangements are finally here! 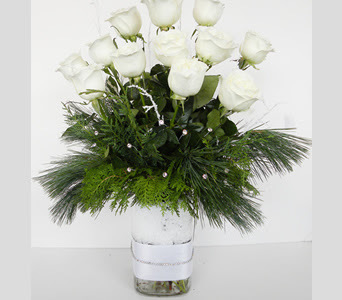 From decorated wreaths to centerpieces in white birch vases, we offer a variety of designs & colors. Don't see one that matches your decor? We would be happy to create a custom arrangement just for you. All of our bouquets include same day delivery.